At least one woman was killed and 19 others wounded when a roadside bomb struck a bus in downtown Kabul during rush hour on Monday, officials said, just days after a deadly insurgent assault on Afghanistan’s biggest military hospital. The powerful blast left the bus badly mangled and the area littered with smoldering debris and twisted metal. No group has so far claimed responsibility for the assault, but it comes as the Taliban step up attacks even before the official start of the annual spring offensive. 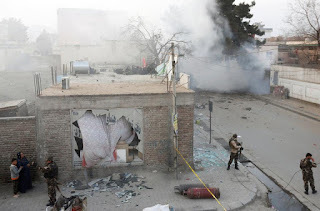 “There has been an explosion against a minibus in Kabul,” Kabul police spokesman Basir Mujahid told AFP, adding that more casualties were feared. Security officials cordoned off the area as firefighters and ambulances rushed to the scene. It was not immediately clear who was on board the bus. The bombing comes after gunmen disguised as doctors stormed Afghanistan’s largest military hospital last Wednesday, with insiders including two interns among the attackers, multiple surviving staff and security sources told AFP. The defence ministry insists only around 30 people were killed by five attackers. But security sources and the survivors, some of whom counted dead bodies, said the death toll exceeded 100. The carnage inside the heavily guarded hospital points at a spectacular intelligence failure and spotlights how insurgents have managed to infiltrate top government and military institutions in Afghanistan. The savagery of the assault was characterised by how the assailants stabbed bed-ridden patients, threw grenades into crowded wards and shot people from point-blank range. The Islamic State group claimed it was behind the attack via its propaganda agency Amaq -- hours after the Taliban denied responsibility. But the survivors AFP spoke to said the attackers chanted “Allahu Akbar” (God is great) and “Long live Taliban” in Pashto. The Taliban, Afghanistan’s largest militant group, is known to distance itself from attacks on medical facilities or those that result in high civilian casualties. 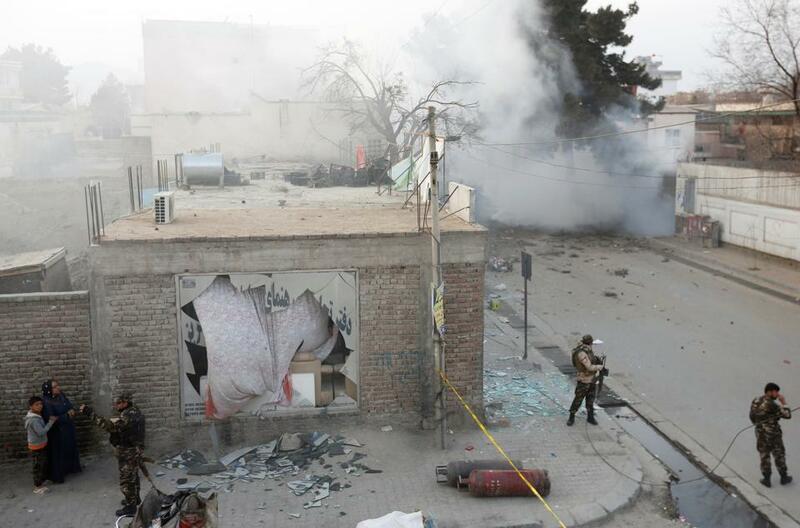 The violence underscores rising insecurity in Afghanistan. The country is bracing for an intense fighting season in the spring as the government’s repeated bids to launch peace negotiations with the Taliban have failed. Afghan forces, already beset by record casualties, desertions and non-existent “ghost soldiers” on the payroll, have been struggling to beat back insurgents since US-led NATO troops ended their combat mission in December 2014. Kabul last month endorsed US General John Nicholson’s call for thousands of additional coalition troops to hold off the militants before the spring offensive. Extra troops were needed to end the stalemate in the war, Nicholson, the top US commander in Afghanistan, told the US Congress in what could be President Donald Trump’s first major test of military strategy.